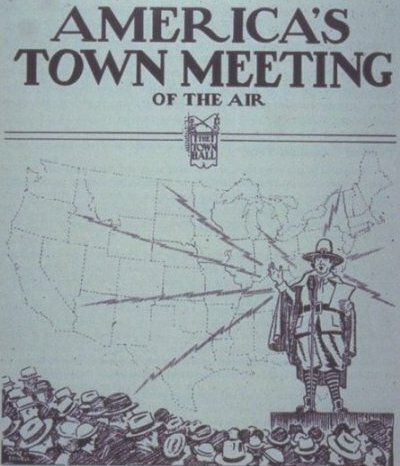 The NBC Radio Network program America's Town Meeting of the Air was an early form of electronic "townhall" democracy--perhaps the very first such electronic forum. In May of 1935 the program began what would become a 21-year run. (In later years the program would be broadcast on the ABC network.) The format of the broadcasts pitted two prominent experts in a debate of some aspect of public policy. The program was unique for its time in that it also featured questions from both the live audience and from the listening audience around the country.